While such statements are always technically true, the implied message isn't always always fair to the customer or the wine in the bottle and it often sets people up for a frustrating let-down. So, with all of this in mind, let me tell you about today's offering. As most of you long-time readers already know, Cavallotto is on my short list of not just Barolo producers, but of wine producers period. Their three Baroli are flat-out amazing wines that are the perfect storm of traditional style, deliciousness, broad appeal and (yes, even at $60-100/btl) value -- especially when compared to the other 20+ year wines on the market from other famous regions. 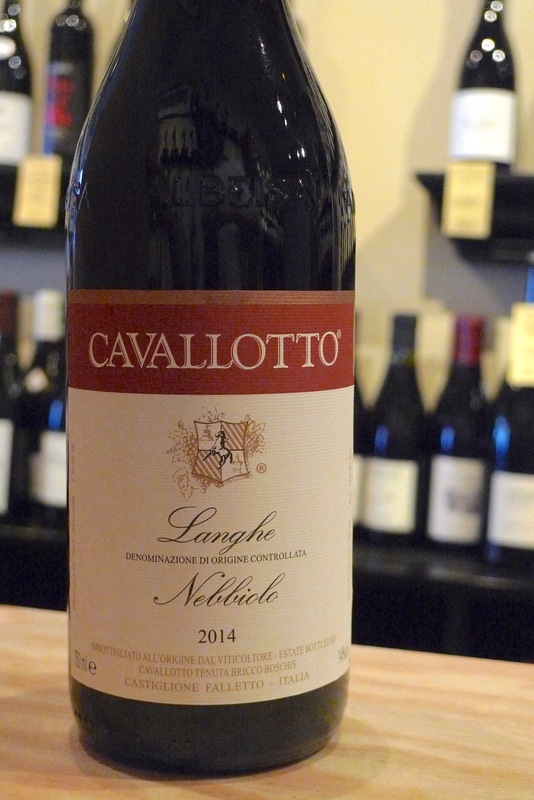 Today, though, we're talking about the only Nebbiolo-based wine that Cavallotto produced for the incredibly challenging 2014 vintage, the basic Langhe Nebbiolo. Normally the Langhe is made from the youngest vines in their Barolo holdings (Bricco Boschis, Vignolo, Codana and Pernanno) and is vinified mostly for early pleasure -- though it's always a sleeper pick for a short stint the cellar. 2014 was pretty miserable for most of Northern Italy and Barolo was no exception. While they did have a pleasant September that saved things from being a total disaster, the rain throughout most the growing season meant that Cavallotto only ended up harvesting 30% of their usual crop. What was left was the absolute best fruit they could muster, but being faced with so little salvageable material, they decided to blend what would have normally gone into the Bricco Boschis, Vigna San Giuseppe and Vignolo bottlings into one single Langhe Nebbiolo. So, yes, you're technically getting these three great wines in one $28 package, which is definitely a great thing. What it is is a proper glass of high-quality-for-the-price Nebbiolo that is structured, dark, powerful, earthy and genuinely delicious. It's a Cavallotto for sure -- not 1999 Riserva San Giuseppe -- but a fine Cavallotto nonetheless. It certainly bears the hallmarks of the rainy Summer, but I believe that's a good thing. Not all wine should be perfect and from the greatest vintage, and it's that mentality that frustrates any honest wine merchant out there. In life, we all take the good and the bad and we make the best out of it. You go to a game and see your team lose a heartbreaker, or you go on vacation only to have it rain the whole time, but you enjoy the time with family and friends all the same. Of all of the things that wine can be, it's also a snapshot in time, or, more specifically, it's an imbibe-able tribute to a window of time, forged by the hands of dedicated artisans. Shouldn't we celebrate such skilled work, even when it represents a difficult period? In fact, when you think about it, we should probably be celebrating skilled handiwork born from challenging circumstances even more than that which originated from the ideal. Here's a chance to toast the hard work of those who do indeed make the best with what they have, vintage in, vintage out. And, in this case, you'll really enjoy a great glass of wine while doing so.